By John Denver. Arranged by Cindy Blevins. Sheet Music Single. 10 pages. Published by Cindy Blevins (H0.229041-32550). 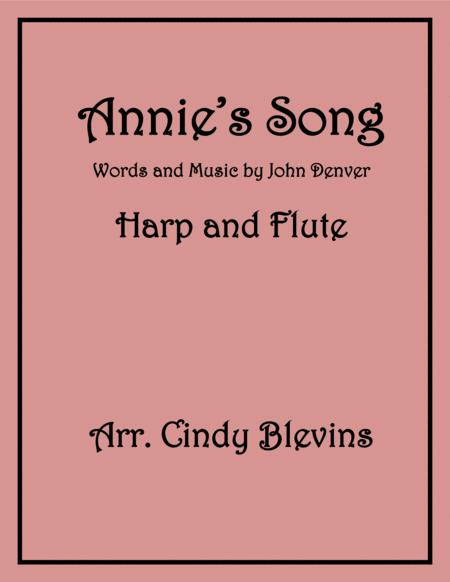 Annie's Song is beautifully arranged for harp and flute. With this download, you receive the score (so you can see how the parts go together), the harp part and the flute part. 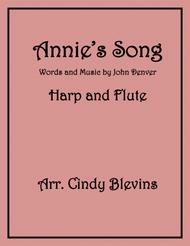 The harp part is for lever harp, and of course can also be played on pedal harp (or even piano). The flute adds a delightful voice, adding melody, harmony, and counter-melody to the harp part. The harp part is three pages long. The flute part is two pages. The sound sample was digitally generated due to time constraints. The arrangement will sound even better played by actual instruments.